Blog 13 Steps That Help Define A Quality Mentoring Program. Do you Complete all 13 Steps? 13 Steps That Help Define A Quality Mentoring Program. Do you Complete all 13 Steps? The Alberta Mentoring Partnership has a multitude of tools and resources to help you create a mentoring program along with more specific resources to help bring your program to the next level, including considerations for creating mentoring programs for special populations. 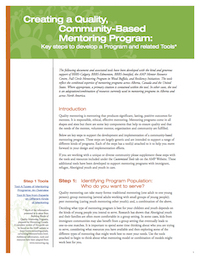 Get started now, and download the Creating a Quality, Community-Based Mentoring Program Toolkit. Quality mentoring is mentoring that produces significant, lasting, positive outcomes for mentees. It is responsible, ethical, effective mentoring. Mentoring programs come in all shapes and sizes but there are some key components that help to ensure quality and that the needs of the mentee, volunteer mentor, organization and community are fulfilled. 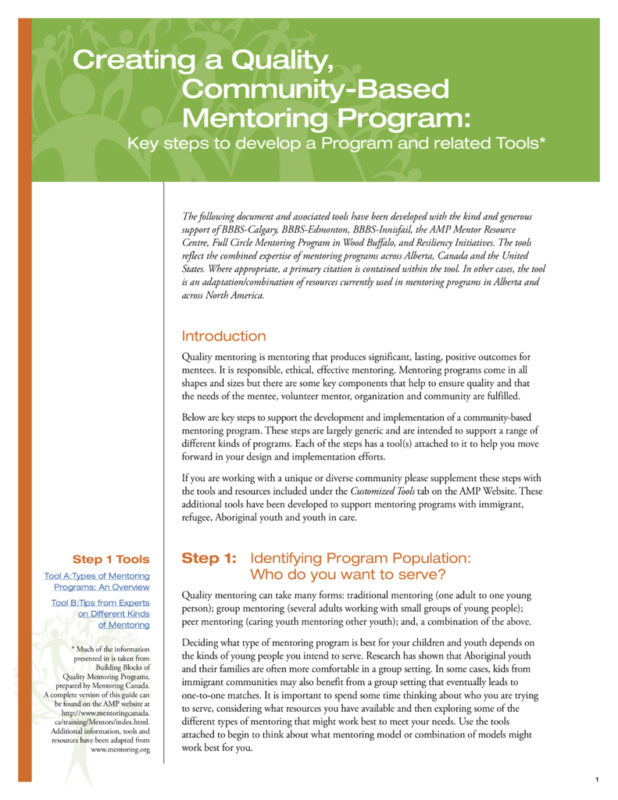 Included in the Creating a Quality, Community-Based Mentoring Program Toolkit are key steps to support the development and implementation of a community-based mentoring program. Working with a unique or diverse community, we have tools and resources for that too. I created the Tutor/Mentor Connection in Chicago in 1993 to help volunteer-based tutor and/or mentor programs grow in all high poverty areas of the city and since then, have been building a library of resources that programs and resource providers can draw from . I found Alberta Mentoring Partnership a few years ago and point to it from my web library and follow on social media. I think your resources are great and congratulate you on putting together all of this. The steps to create a quality mentoring program are pretty closely aligned with a presentation I put on my site more than a decade ago, under “Steps to Start and Grow a Tutor/Mentor Program”. You can find this along with a planning calendar pdf and some operating principles that I learned during my 35 years of leading a single program in Chicago. I hope this enhances what you are already sharing. In hope more people will find our sites and learn from both of us.